559 Bloor Street West, Toronto, ON. 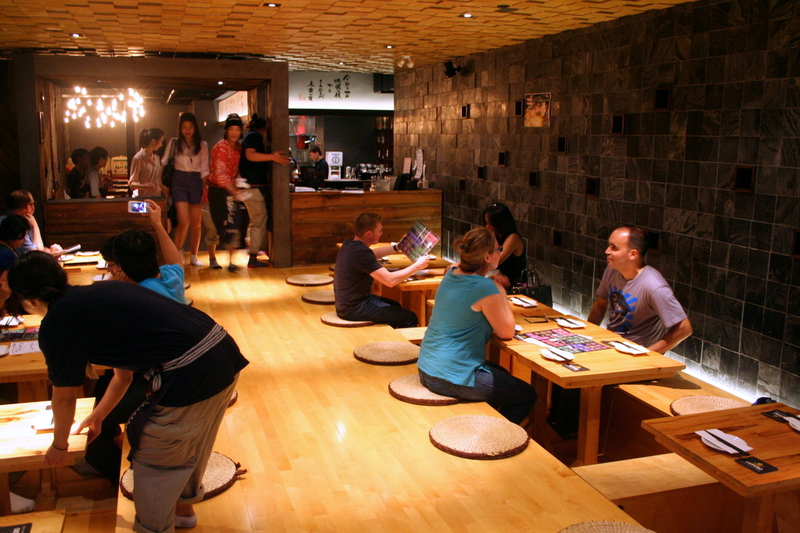 Guu’s second Toronto location, in the Annex, serves up both traditional and nouveau dishes in a Japanese bar (izakaya) setting. 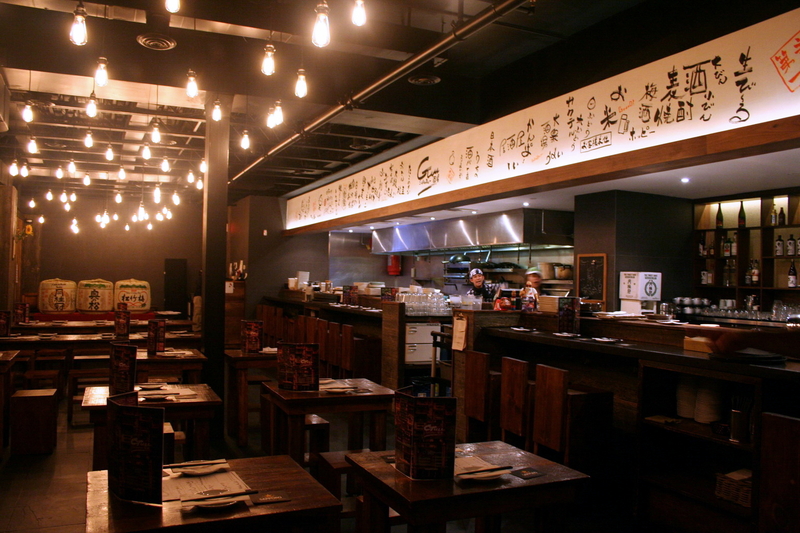 Each of Guu’s location has a slightly different menu, but the quality is consistently high. 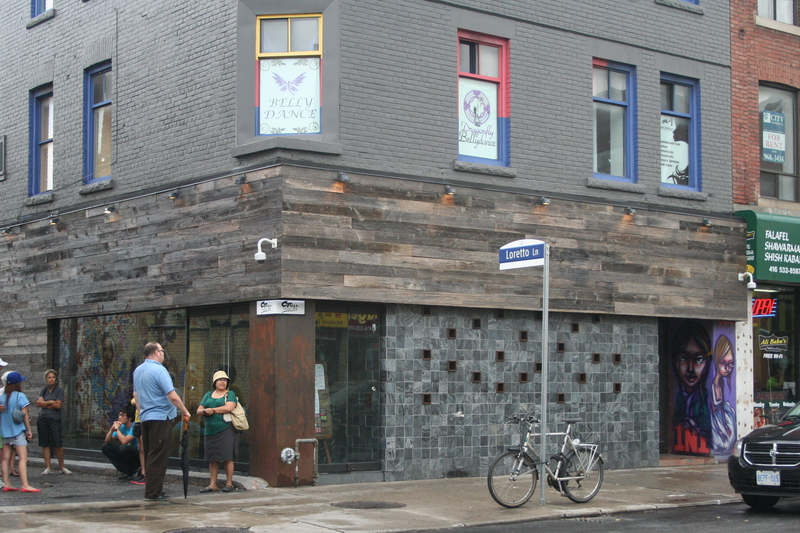 Showing up at 5:30, a small line of eager diners had already formed outside. 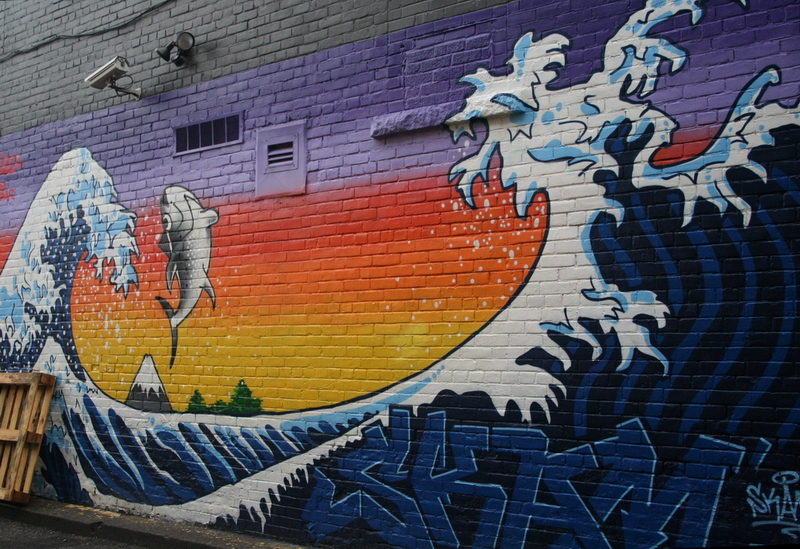 Outside, it looks like they’ve commissioned art on the wall along the alleyway. It fits in comfortable in the Annex neighbourhood. The venue is much larger than their other Toronto location. One side of the space is set up like a traditional bar, with both tables and a bar area. Staff shout greetings at customers as they come and leave. This location also has a hardwood floor seating area, with recessed flooring for your legs to dangle. It does make walking around a bit trickier, especially for those with socks, as the floor gets slippery. Offering a wide selection of sake, they’ve even branched out into making their own house brand. Unfortunately, I’m not able to provide a very robust description of the flavour. Spicy Negitoro – spicy chopped BC Tuna w/ Green Onion ($5.80) Served with sheets of roasted seaweed, I feel that the seaweed might actually overpower the flavour of the spicy tuna. The spice also didn’t have very much kick. Not sure if I would order this again. 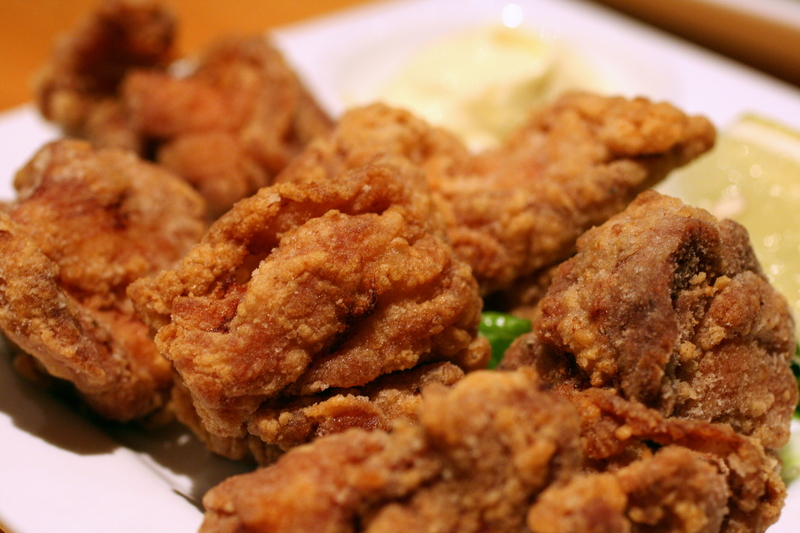 Karaage – deep fried soy-sauce-marinated chicken served w/ Garlic Mayo ($6.80) Exactly as it sounds, reasonally marinated (actually could have been brined a bit more), the deboned dark meat is solid. The batter is thin, crisp, and just lightly seasoned. Takoyaki – deep fried octopus ball w/ tonkatsu sauce & karashi mayo ($5.00) Comparing again to Fin’s takoyaki, Guu’s rendition are a little bit smaller, deep-fried to a delicately crispiness on the outside, with a very smooth, flavourful batter inside. 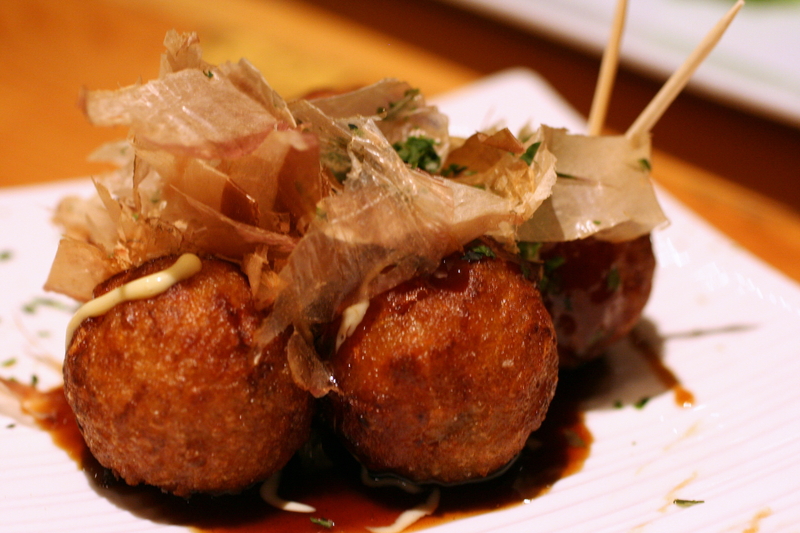 The amount of sauce is just right, not overpowering the takoyaki at all. 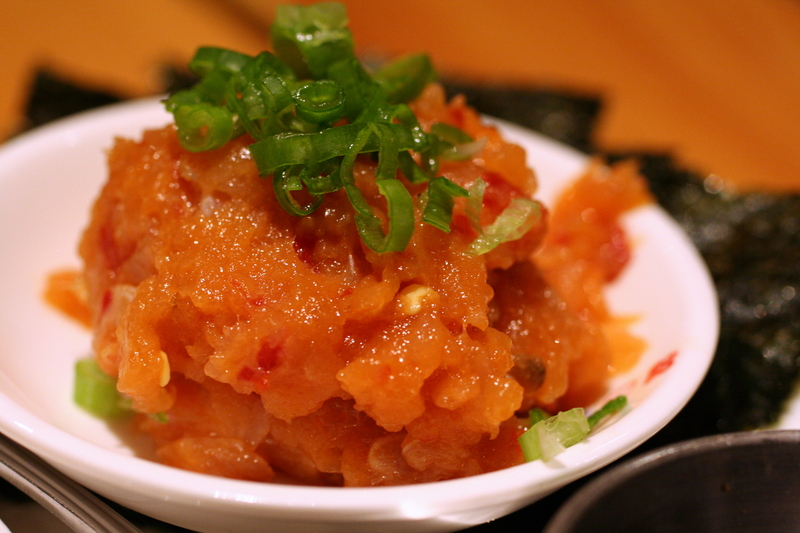 You can taste the tiny bits of pickled ginger inside, that balances out the salty and creaminess from the sauce. The waving bonito flakes and seaweed powder add another boost of umami to the dish. 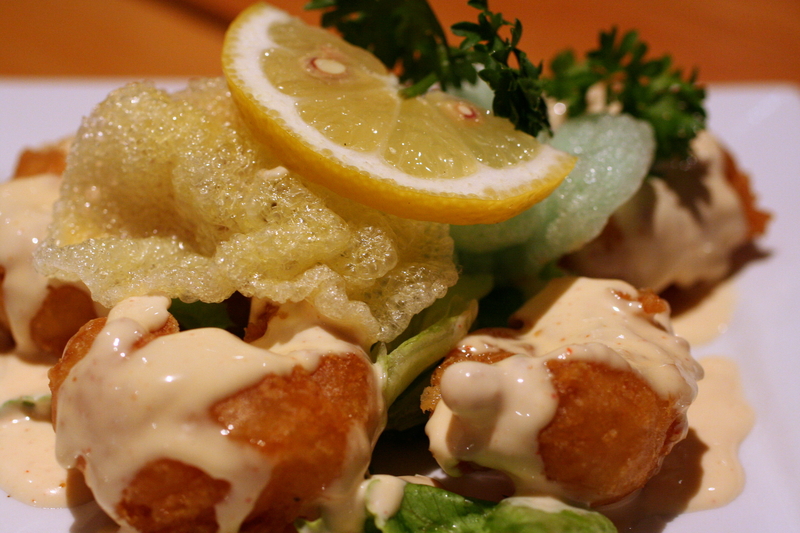 Ebimayo – deep fried prawn w/ spicy mayo ($7.80) Having loved the Ebimayo at Fin Izakaya, I figured this would be an interesting comparison point. It’s a much “softer” dish, in terms of both texture and flavour. The batter is slightly crispy with a soft, medium-thick batter. The texture works very well with the shrimp. The sauce could have used a bit more kick, but was otherwise good. The tapioca chips were a bit soggy and oily, sadly. Definitely far less intense flavours than Fin’s rendition. 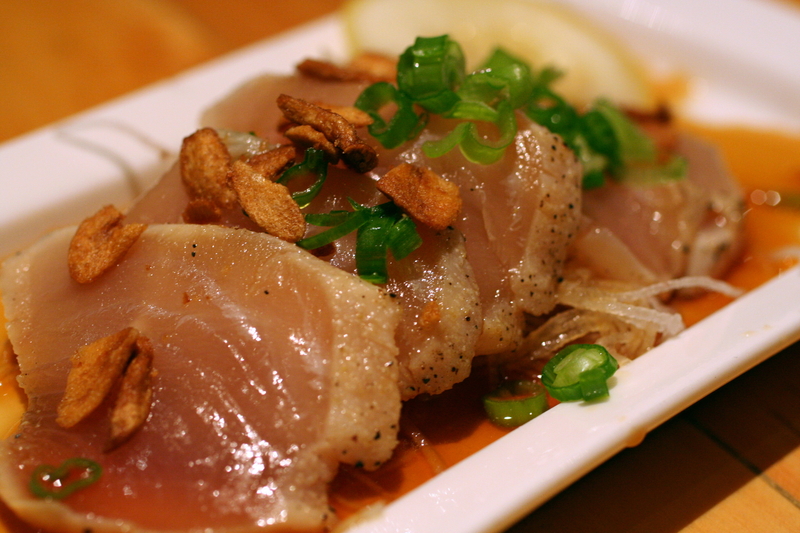 Maguro Tataki – seared BC tuna sashimi w/ ponzu & garlic chips ($6.80) The sear was very well-executed, but nothing about the flavour or texture was particularly stand-out. Nice light dish, to contrast with the other deep-fried items. 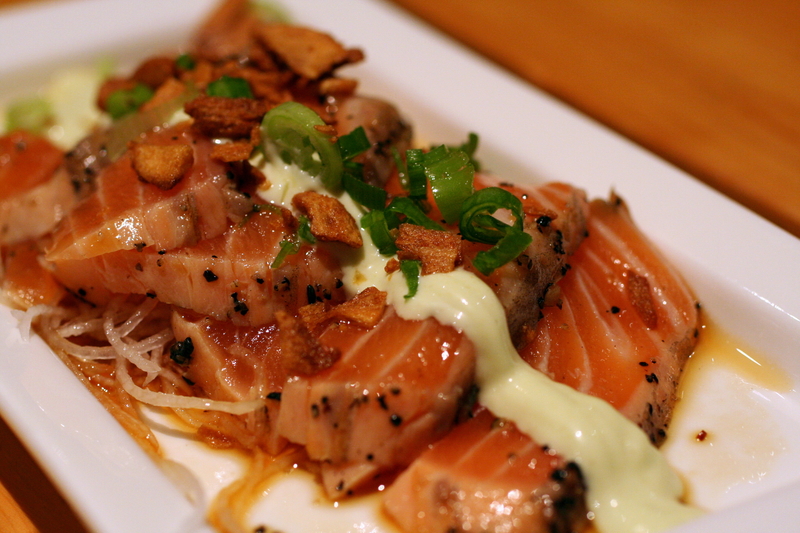 Salmon Tataki – seared BC salmon sashimi w/ ponzu, wasabi mayo & garlic chips ($6.80) Also not particularly stand-out, it was a decent passable dish. Again, a lighter dish, to contrast with the other deep-fried items. Ingen – green bean tempura with matcha salt ($5.20) A thin crunchy batter, the accompanying dish of matcha (green tea powder) salt absolutely makes this dish. 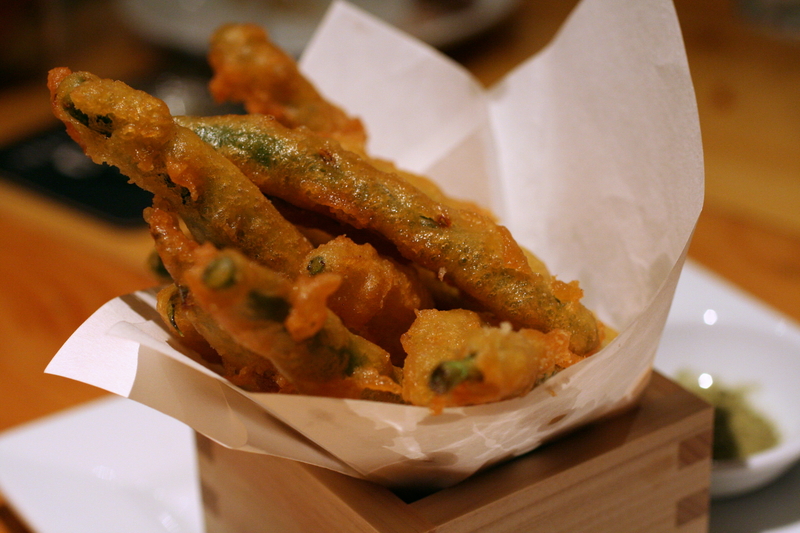 The green bean tempura, while a competent finger snack, serves much better as a matcha salt delivery mechanism. The mix of bitter, salty, and a hint of earthy greens, gives the green bean enough complexity to make it a “wow”. Salmon Natto Yukke – chopped salsmon sashimi w/ 7 friends (natto ~ fermented soybean, takuan ~ pickled radish, shibazuke ~ purple pickled cucumber, wonton chips, garlic chips, scallion, raw egg yolk. ($8.80) This was probably the most unusual dish of the evening. The dish is brought to the table with all the ingredient beautifully arranged (http://www.flickr.com/photos/jlunar/4193133649/). The server mixes together all the ingredients, which you spoon onto sheets of roasted seaweed. 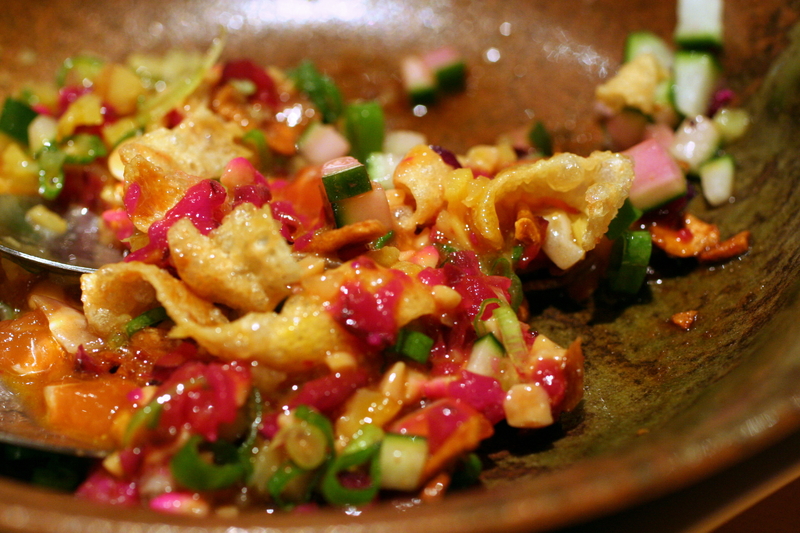 The natto and egg yolk create a gooey stickiness, while the wonton chips and cucumbers add the crunch. It’s definitely an acquired taste, with a lot of strong flavours and saltiness that would go great with beer. 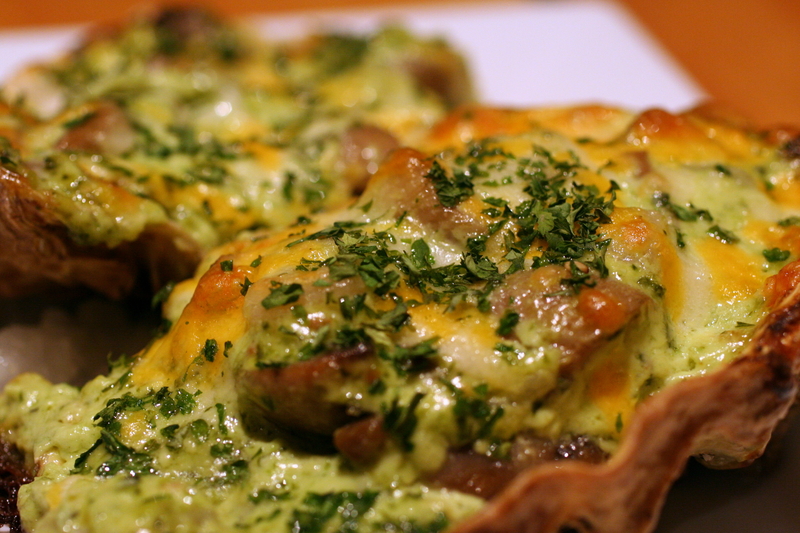 Kakimayo – baked BC oyster w/ mushrooms, spinach & garlic mayo topped w/ cheese ($7.20) A little bit difficult to share amongst a large group, the sauce was creamy without being too rich and cheesy. Having had cheese-topped oysters before, I was glad this wasn’t the case. Be aware that the white mush is a mound of salt, and not daikon radish (as some of us found out the hard way). Karubi – sweet & spicy miso grilled beef short ribs ($6.80) Can’t say I really tasted the miso flavour. 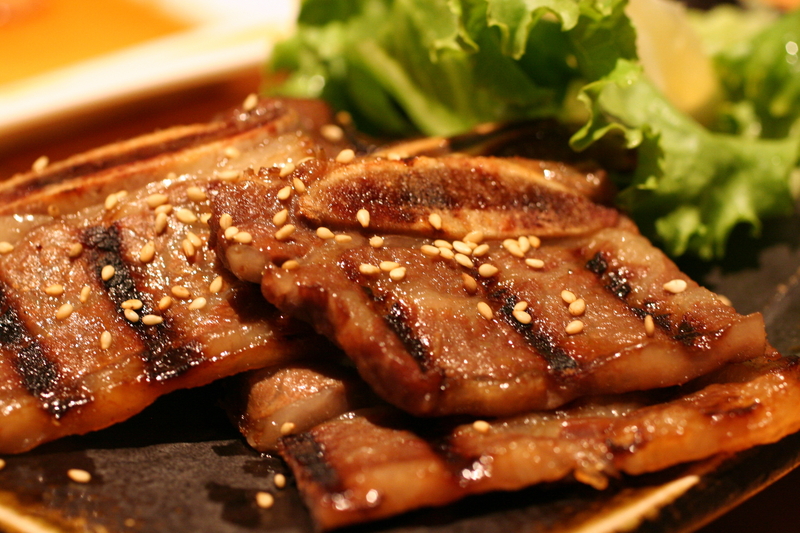 For the most part, it tasted like kalbi short ribs. There’s nothing wrong with these, they were very well-executed and quite tender, but it just didn’t really stand out from its korean brethren. Wouldn’t need to order this again. 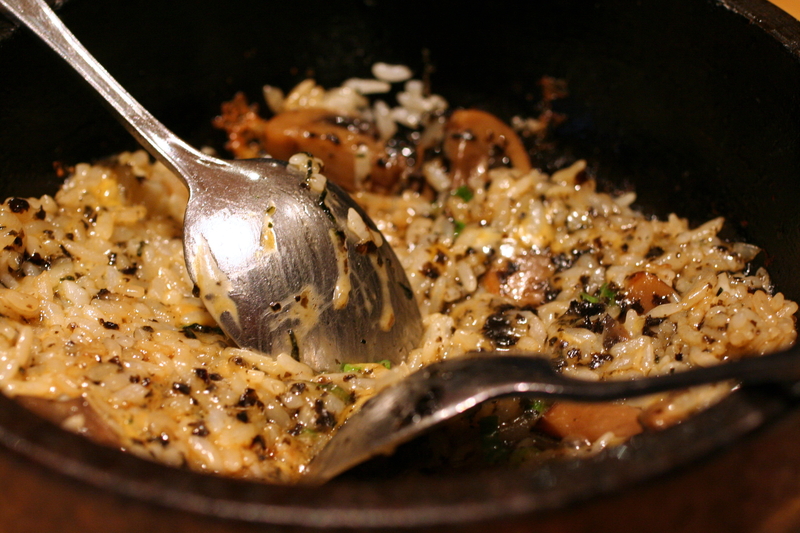 Kinoko Bibimbap – rice, mushrooms & cheese w/ seaweed sauce in sizzling stone bowl ($8.80) One of the standout dishes of the evening, it’s a happy medium between a mushroom risotto and bibimbap. It’s very much like an earthy mushroom risotto, with the creaminess and mild sharpness of the cheese. The seaweed adds a third element of umami, and there’s enough saltiness between the cheese and seaweed to bring out some of the flavour form the rice and mushrooms. I disliked that the server stirred up and mixed the bowl right away, instead of giving the rice enough time to form a crust against the hot stone bowl. looks exactly like the Vancouver locations! 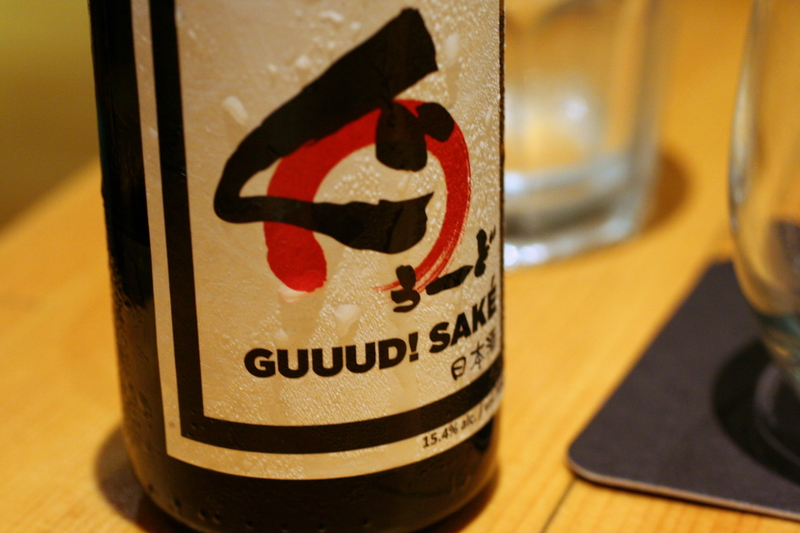 When you are in Vancity, go try Guu Garden! I’ve only been to one Guu location in VanC. I expect that the next time I’m in Van, you’re going to take me on a culinary tour. Ahem.